Nolemana and I drove home along a country road on our way home from visiting long-time friends. We saw something so perfect for my photo of the day that I turned around, drove back, and turned around again so that I could take the photo. 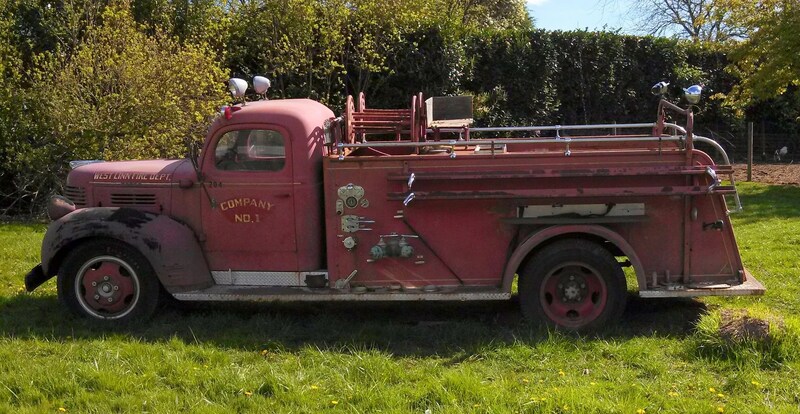 This old fire engine used to belong to the City of West Linn, Oregon. It looked pretty cool sitting out there. Fire engines today have really changed; not so the brave men and women who drive them and fight fires. I personally know two firemen, and really admire their bravery in the midst of extreme danger. That truck is outstanding in its field. (Can trucks stand?) Nice contrast of the bright red against the cool green. It is, indeed, pretty cool.